Adding to this morning's report from The Wall Street Journal pointing towards a curved OLED screen for Apple's upcoming "iWatch", The New York Times has released several details about the wearable device, suggesting it will have a flexible display and wireless charging capabilities. Echoing past rumors, The New York Times says the iWatch will come in two separate sizes, focusing on health/fitness and mobile computing tasks, and that it will allow people to make purchases with included NFC support. Its flexible display is described as "unique," and Apple is said to have settled on wireless charging after a failed experiment with solar charging. It has a flexible display panel that is protected by a cover composed of sapphire, a type of tougher glass, they said. The device's circuit board, which includes its sensors and chips, was described as tiny, about the size of a postage stamp. According to unnamed employees who spoke to The New York Times, Apple's iWatch is "one of Apple's most ambitious projects to date," with an "enormous" amount of time and money put into the health and fitness sensors in the device, which will be "much more" accurate than existing fitness devices. Rumors have suggested the iWatch will measure an array of different health-related metrics, from steps taken and sleep quality to blood pressure. The iWatch is said to take advantage of HealthKit, a set of APIs Apple introduced alongside iOS 8 that will integrate into existing health devices and apps, reporting data to a central location. It's also going to rely on Handoff, a Continuity feature that lets users seamlessly transition tasks from one iOS or Mac device to another. The report also echoes a litany of rumors that have suggested Apple's wearable device will not be available for purchase until 2015, despite Apple's plans to unveil the iWatch at its September 9 media event. The gap between the introduction of the iWatch and its debut will give Apple time to finish work on the device as well as provide an opportunity for developers to create new apps suited to the smaller form factor. Knowing how much Tim Cook loves wearing the Nike Fuel Band, maybe this mockup is close to the real deal, with a thin flexible screen.. When I heard that Nike disbanded the FuelBand team a while back and knowing the Tim Cook is on the Nike board, I assumed that a closer relationship might be in the works. This got me thinking in more detail about how the device might function, which led me to create a concept based on what Id like to see in the device. This concept is influenced by the sleek design of the Nike+ FuelBand. This type of band could provide space for the battery within the band itself. A magnetic clasp with a positive locking mechanism so that it snaps into place like a Magsafe adapter would be a classic Apple touch. Maybe different size clasps to allow for a range of wrist sizes? A glossy outer shell with a soft rubberized inner band looks great in renders, but Im not sure how it would hold up to daily abuse. I think a Home button/Touch ID is a given and would be useful for triggering Siri or authorizing a payment via NFC with your fingerprint. Two side buttons with context sensitive functionality would make sense. In the Music player, they could function as volume controls or as Start/Stop controls in fitness apps. You could even press them together to trigger a third action such as Play/Pause. Having physical buttons on a device this size is important since youre going to want to operate it via feel on occasion. The UI might rotate intelligently based on orientation, adopting a horizontal display for the lock screen (time display) but switching to a vertical strip when you raise your wrist towards you. Because the bottom of the display is going to be closer to the user and angled towards them, I can see the status bar being placed on the bottom and most interactions favoring the bottom portion of the screen. Looking forward to seeing what new user interactions theyve created for this form factor. The device is going to be too small for text entry, so Siri is going to be much more important and will probably be a primary way you interact with it. Notification displays and response will be another key role for the device so you dont have to constantly pull your iPhone out of your pocket or bag. Id love to see some physical interactions such as shaking your wrist to dismiss a notification. Or maybe these kind of gestures could be used to control external devices via HomeKit or act as a remote for your AppleTV. 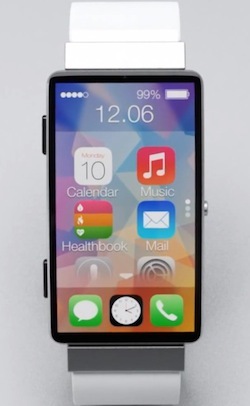 This will probably be the flagship device for HealthKit and I cant wait to see what kind of sensors are included. Activity tracking is a given, but Im eager to see if they include heart rate or even more exotic sensors. The band is the area thats most likely to have sensors in it since its the location where the veins are closest to the surface of the skin. I can see the device being the user interface and disconnected storage for a wide range of health/fitness devices that communicate over Bluetooth 4LE. We may see the rise of an entirely new ecosystem of devices that pair with the iWatch over NFC and Bluetooth. I can envision touching your iWatch to the console of an NFC enabled treadmill and having it relay activity data directly into your iWatch to HealthKit. Or maybe a blood glucose meter, blood pressure or any number of diagnostic devices. Wireless charging has been rumored and Id love to see it happen. I would imagine that near-contact inductive charging is most likely although Apple may surprise us since theyve made some acquisitions around this tech over the past few years. I think the Lightning connector is brilliant, but Im not looking forward to having to plug in yet another device. Especially if the battery life is less than several days, which is probably going to be the case. In any event, in less than a week, I hope I can look back at this post and laugh at how quaint this concept is compared to the real thing. Yes, I want to wear a watch like this on my wrist. Not. No chance someone with any taste of style would want an iWatch on their wrist. People said the same about iPods, iPhones, and iPads prior to their unveiling. Your comment will be looked upon years from now and laugh at your expense. It has a flexible display panel that is protected by a cover composed of sapphire, a type of tougher glass, they said. Sapphire and flexible? Must be a coating. I can't wait. My body parts are ready. We'll just put you in the "no, and proud of it!" Column. You have my permission not to include a hideous mock up picture with every iWatch story. There is absolutely no chance that any of these pictures will be even remotely accurate. They have nothing at all to do with the story. Let it go.